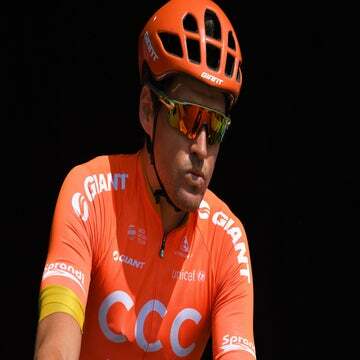 GENT, Belgium (VN) — Greg Van Avermaet (CCC Team) is taking his frustration out on the upcoming cobbled classics on home soil in Belgium. Van Avermaet had a string of near misses in Italy at Strade Bianche and Tirreno-Adriatico, and another “frustrating” day at Milano-Sanremo on Saturday. “It’s always exciting to get to this point in the season, the final races before Tour of Flanders and Paris-Roubaix,” Van Avermaet said in a press release. “I feel good and am confident in the shape I have after Italy. Van Avermaet, from Lokeren, Belgium, is hoping the familiar cobbled roads will treat him better than those in southern Europe. The winner of the 2017 Paris-Roubaix has been firing all spring, but coming up empty-handed in the big races. Julian Alaphilippe (Deceuninck-Quick-Step) beat him to win Strade Bianche (Van Avermaet was sixth) and again did so in stage 2 of Tirreno-Adriatico to Pomarance. In Milano-Sanremo on Saturday, Van Avermaet could only blame himself for losing position ahead of the final Poggio climb. He was so upset with his race, he would not speak afterward. “It was the second time that Milano-Sanremo ended in a scenario where I could’ve had a chance, and for the second time I was not there,” he told Het Laatste Nieuws a day later. “I was too far back on the Poggio. Frustrating, especially when you see how many people rode to the finish line. Van Avermaet also felt that 2017 was his chance. That year, eventual winner Michal Kwiatkowski rode clear with Peter Sagan and Alaphilippe. In 2019, the Belgian finished in Sanremo in 42nd position. In the E3 Binckbank Classic and Gent-Wevelgem he will return north to the cobbled roads for the first time since placing second behind Bob Jungels (Deceuninck-Quick-Step) in the Omloop Het Nieuwsblad in early March. “As a team, we have raced the last two months together and I think we are working well,” he said in a press release Thursday. The CCC roster for the E3 BinckBank Classic includes Kamil Gradek, Michael Schär, Gijs Van Hoecke, Nathan Van Hooydonck, Guillaume Van Keirsbulck, and Lukasz Wisniowski. Van Avermaet relies on their help to reach the final but said he is ultimately responsible for winning or losing. “As a leader, you must take your own responsibility. I do not blame my team for anything, I blame myself,” he told Het Laatste Nieuws of Milano-Sanremo.